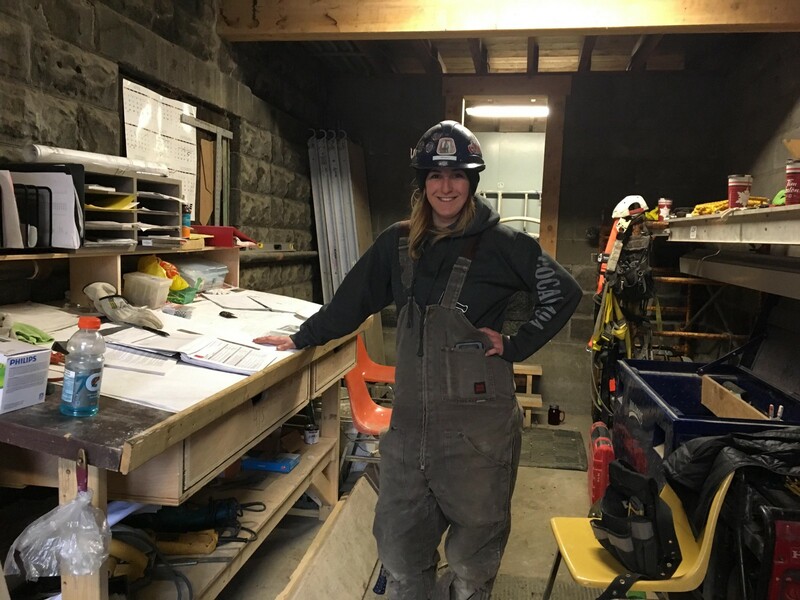 Natalie Daikow is a level-two carpenter’s apprentice through United Brotherhood Of Carpenters & Joiners Of America, Local 494. 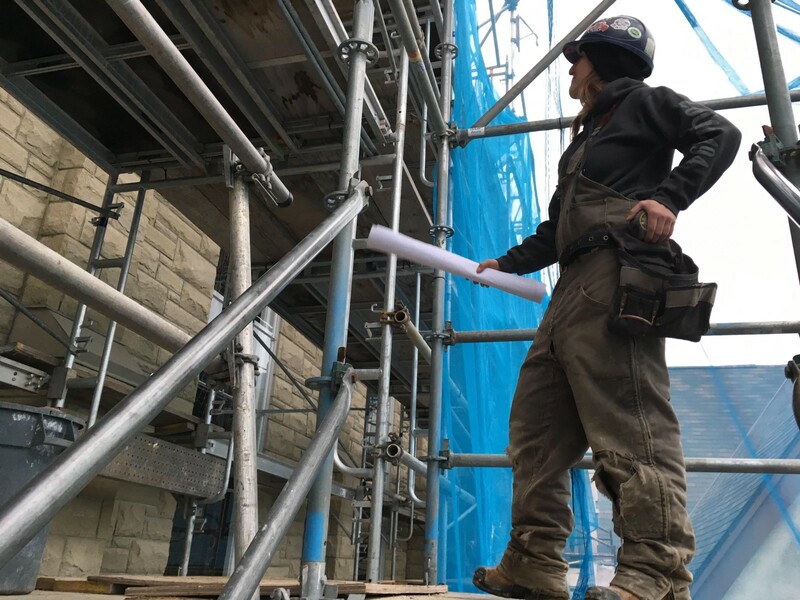 Starting in 2015, she has worked on construction sites around Windsor-Essex, including solar farms, grocery stores, hospitals, homes, and St. Anne’s Church. 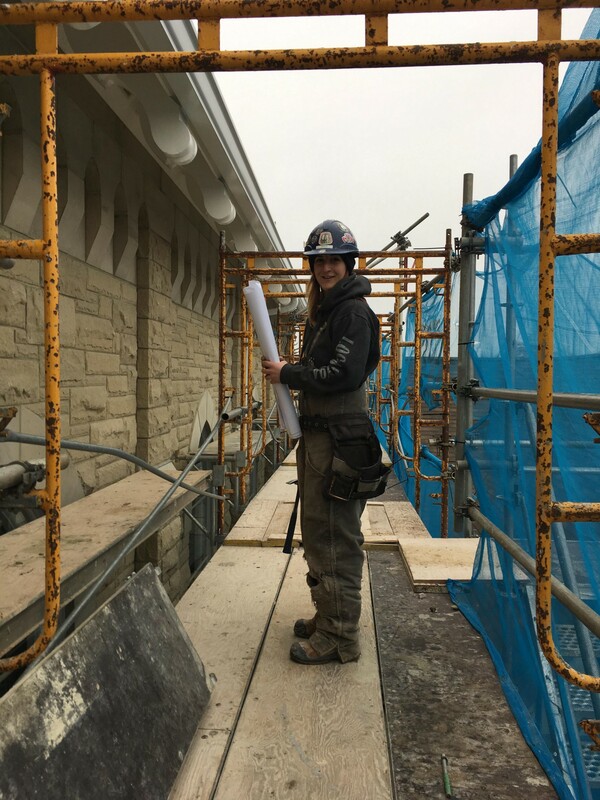 We caught up with her at the St. Anne’s job site where she and the other carpenters were working on concrete form-work, building scaffolding, demolishing and reconstructing 140 year old brick, and preparing the site for the next group of skilled trades. Like many skilled trades, carpenters are in-demand. 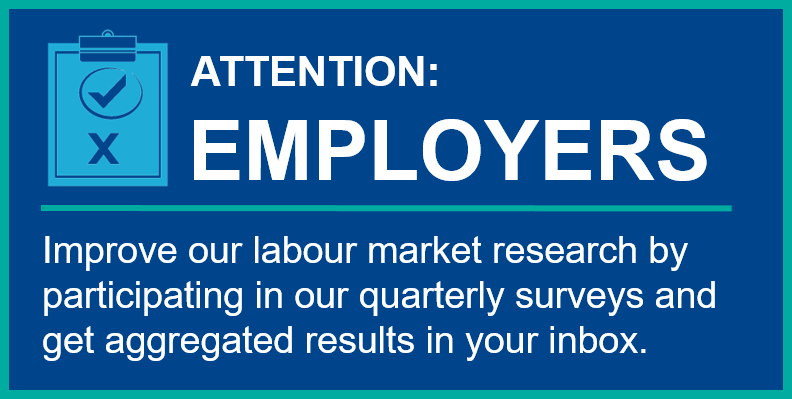 You can learn more about being a carpenter through our Career Profile. Carpenters can do pretty much anything: concrete form-work, scaffolding, framing, drywall, steel studs, renovations. It’s a complicated question because it could be: what do carpenters not do? What interested you about carpentry? I didn’t become motivated to do it until my parents moved to Southeast Asia and I looked after their house. As anyone who owns a home knows, things go wrong. I hated that I was 22 years old and didn’t know how to do anything. I come from a purely academic family and no one was in the trades. Whenever I would have contractors come in to quote me prices on maintenance work, I would be trying so hard to not be cheated. They could tell me any price and I wouldn’t know any better. I never wanted to be dependent on someone else for something that meant so much to me. Your life is in your house. It wasn’t until 2015 when I put my foot down and said that I wanted to be a carpenter. I talked to my best friend’s husband. He’s a carpenter and went to college for two years for carpentry techniques. I told him my hesitations about going to school and he suggested I go into the union. I called up Local 494, our local Carpenter’s Union in Windsor and I asked to talk to one of the representatives. I said that I wanted to be a carpenter but didn’t have any experience. I was coming from a Psychology degree in University. He said the union would be the best route for me because college is a different kind of avenue. I joined the union and signed up as a carpenter’s apprentice. Every year, I work for 1,800 hours for a contractor and then I go to school at St. Clair College for carpentry for two months. There are three levels of carpentry school and it’s only two months long, full-time. After that, you write your qualification exam and once you pass that you’re considered a journeyman carpenter. This 7200 hour apprenticeship program is comprised of three levels of trade school as well as job specific mandatory training programs and on-the-job training. This is a partnership between the union, Ministry of Training, Colleges, and Universities (MTCU), and Ontario College of Trades (OCOT). Upon completion of all elements of the program, apprentices will be obligated to challenge their Certificate of Qualification (C of Q) to obtain their Red Seal Certificate. It takes roughly five years. For some people it can take longer or shorter; it all depends on your work hours. I was accepted into the carpentry techniques program at St. Clair and Niagara, but I felt like the union was the best route for me. I wanted that experience and wanted to work for a year and a half before I went to school. You then get to apply that knowledge to the work. It’s a really good way to learn and to build on skills. What kind of learning do you do as an apprentice? There are a million different courses you can take through the union. There are minimum courses you must take before you start working, for safety: working at heights, WHIMS, confined spaces. Every new level that you achieve, you will have more courses that you can take. Some of it depends on what your interests are. I have taken training for rough terrain forklifts, scissor lifts, scaffolding, and hoisting and rigging. All the training you do through the union is paid for. I want to learn how to do everything and take every class I can. With becoming an apprentice, you are jumping in to the work world. What advice would you give to people starting? To settle some ease for people, who worry about becoming a union apprentice and working right away without knowing anything: You are never going to be told to do something that you don’t know how to do or someone isn’t there teaching you. 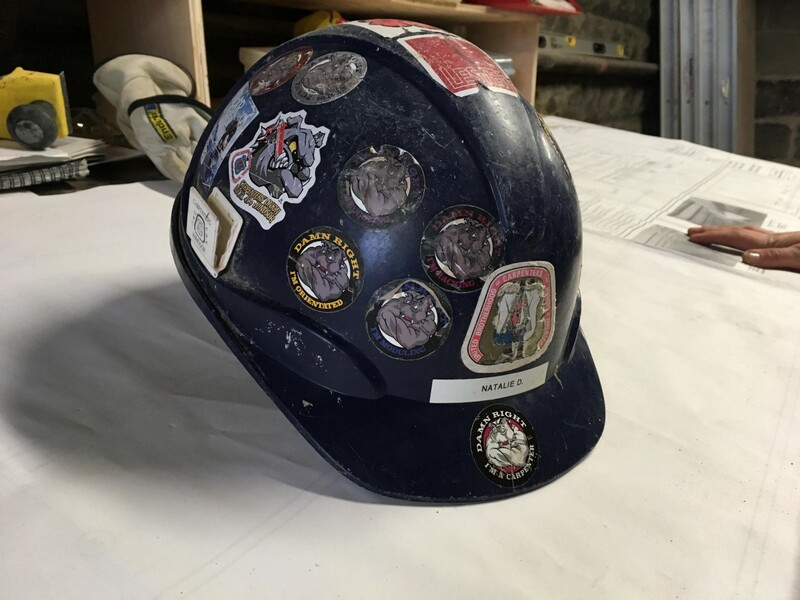 You are always going to be onsite with someone who is a journeyman with a vast amount of experience. Someone will either show you how to do it or you can learn how to do it. No one will ever ask you to build a house by yourself. Sometimes you will be asked to figure out how to do something but you will have the skills and the knowledge. There will always be someone to help and check your work. No one in my family has worked as a carpenter. A lot of people get into carpentry from their grandparents or parents, so they already have a huge base knowledge. I didn’t know how to read a measuring tape when I started. As it turns out, people don’t just count in quarter inches. Someone had to teach me all that. Do your research. Talk to non-union carpenters, union-carpenters, general contractors, people who just do renovations, or just do framing, or flip houses. The range of skills is so enormous. What is it like to be a woman working as a carpenter? There are roughly 600 members in my union in Windsor-Essex. I’m the only one on the carpentry side and there are two or three females on the acoustic technician side. I’m often the first female a foreman has ever worked with on a job site. It was very intimidating and scary to go onto a job site for the first time and seeing the shock of a foreman who has never worked with a woman and has no idea why you’re there. The union is a family. Every job site that I go to there will be a bunch of my Brothers. I’m a “Sister in the Brotherhood” and there are tons of females in the carpenter union as a whole. In Windsor, I’m one of the few. 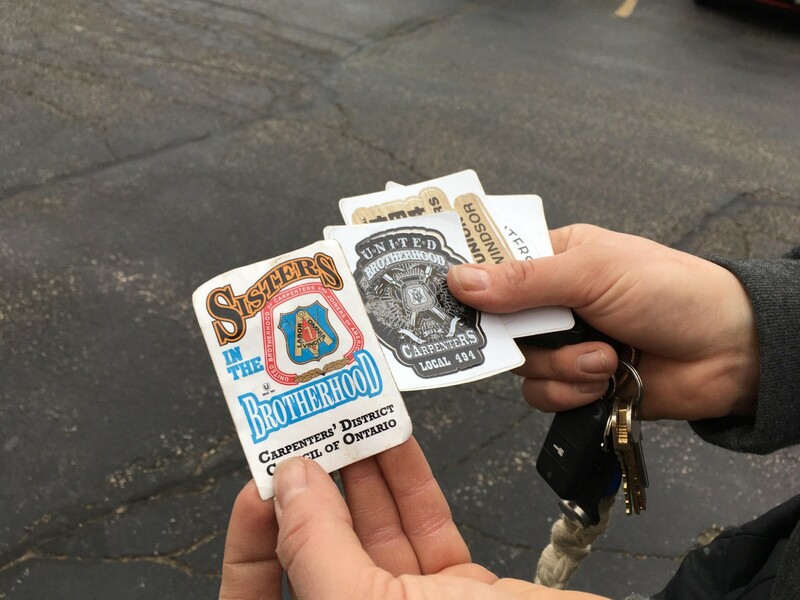 Any time I’m on a job site, I have 3 to 10 Brothers with me at any time. We are always looking after each other. It’s the greatest feeling in the entire world. You build a family when you’re at a job. You spend 40 hours a week together. You’re working hard, you learn from each other, and you care for each other. For anyone is worried or not fully confident about going into the field, I would highly recommend a union because it’s so supportive.